What conditions does Macrobid treat? This medication may cause your urine to turn dark yellow or brown in color. This is usually a harmless, temporary effect and will disappear when the medication is stopped. However, dark brown urine can also be a sign of rare side effects (liver problems or anemia). Therefore, seek immediate medical attention if you notice dark urine along with any of the following symptoms: persistent nausea/vomiting, stomach/abdominal pain, yellowing eyes/skin, tiredness, fast/pounding heartbeat. Tell your doctor right away if any of these rare but very serious side effects occur: eye pain, vision changes, mental/mood changes, persistent/severe headaches, new signs of infection (e.g., fever, persistent sore throat), easy bruising/bleeding. Seek immediate medical attention if you develop the following rare but very serious side effects: numbness/tingling of the hands/feet, unusual muscle weakness. This medication may rarely cause a severe intestinal condition (Clostridium difficile-associated diarrhea) due to a resistant bacteria. This condition may occur during treatment or even weeks to months after treatment has stopped. Do not use anti-diarrhea products or narcotic pain medications if you have the following symptoms because these products may make them worse. Tell your doctor right away if you develop: persistent diarrhea, abdominal or stomach pain/cramping, blood/mucus in your stool. List Macrobid side effects by likelihood and severity. This medication should not be used if you have certain medical conditions. Before using this medicine, consult your doctor or pharmacist if you have: kidney disease (e.g., little or no urine output), a certain genetic condition (G-6-PD deficiency), a history of liver problems due to nitrofurantoin use in the past. Before using this medication, tell your doctor or pharmacist your medical history, especially of: liver disease, lung disease, numbness/tingling of the arms/legs, vitamin B deficiency, mineral imbalance, blood disorders (e.g., anemia), diabetes, persistent weakness due to long-term disease, certain eye disorders (e.g., optic neuritis). What should I know regarding pregnancy, nursing and administering Macrobid to children or the elderly? Before using this medication, tell your doctor or pharmacist of all prescription and nonprescription/herbal products you may use, especially: certain drugs to treat gout (uricosuric drugs such as sulfinpyrazone). Does Macrobid interact with other medications? Should I avoid certain foods while taking Macrobid? 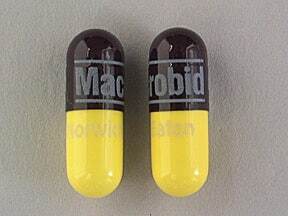 This medicine is a yellow black, oblong, capsule imprinted with "Macrobid" and "Norwich Eaton". 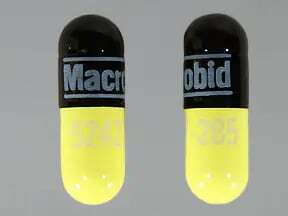 This medicine is a yellow black, oblong, capsule imprinted with "Macrobid" and "52427-285". Are you considering switching to Macrobid? How long have you been taking Macrobid?